On this day of Mother's Day, i wish to share my tribute to all mother beings. To those who are mothers themselves; to the mothers of all of us that live - to whom we owe our lives; and to the loving mother within you - within all of us. Of course, if we share more than 50% of our DNA with carrots, imagine how much all of us of every gender share the kamma or the capacity for loving mothering! During our last year's Western Buddhist Monastic Gathering, an eminent psychologist gave a presentation on "Spiritual Bypassing". In his introductory lecture, he mentioned his thought that at the heart of all religion and spiritual practice, we share the anxiety of our incarnation as beings that grew up in the exquisitely nourished and protected environment of the womb, and were then expelled in this way from our primal, genitive Eden. And then feeling the agony of separation. A feeling attenuated by the holding of the mother, and the mutual beholding in enraptured loving attention, when child and mother gaze into each other's eyes. And then that changes. He mentioned that in a way, our whole lives and our spiritual journeys are then based upon and centered in that love, the separation, and finding, within ourselves and our later relationships (including our relationships with ourselves), that reunion or relegare. Relagare is Latin for religion -- that is, reunion. I spoke in marvel at that time of the power of Metta. In the Karaniya Metta Sutta, the Buddha explicitly invokes the example of a mother's love for her only child (the chant). This memory is invoked and activated in us. And then we allow this activated metta to thoroughly pervade our bodies and minds. With the feelings and perceptions of being known and held in love. And then it is spread outwards. Outwards from our skin, our pores, our body, our heart center -- even from our heads -- up to the top of our heads. Above, below around and everywhere, to all as to myself. And unbound, expanded -- abundant, exalted, immeasurable; without hostility, without ill will (Four Boundless Qualities). Our whole nervous system repolarizes. Our cells rejoice in the bath of Metta. Our brains light up -- throughout our bodies. The energy field around us shifts, brightens -- becoming like adancing, radiating rainbow of liquid gold. Our world is illuminated. "This is said to be the divine abiding". Not only are we to do this once, but again and again, "whether standing or walking, seated or lying down". Multiple dimensions of the interelationships of our being are illuminated and defragmented. When we become so concentrated, we enter samadhi -- the final fold of the Noble Eightfold Path. The Path-fold that links directly back into and serves as the primary supportive condition for insight, the arising of wisdom and right view. Samadhi is a unified experience -- it is an experience of re-union. The reunion of all of our faculties that have been fractured, fragmented, dispersed -- all coming back together again in harmony with one another. All of the energies of our bodies, our hearts, our minds -- coming together -- unified. And this is an exhalted experience, leading to deeper such. 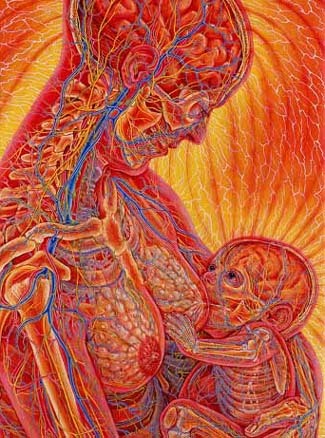 An experience that is part and parcel of our humanity, our heritage in having come to birth as a womb-born human being. An experience that can not be copyrighted by an religious or not religious tradition, but was much exemplified and encouraged by the Buddha, who gave very much precise and detailed instruction in its cultivation, its development and its practice, and included this experience as eighth in the Noble Eightfold Path, as one third of the Three-fold Training, as one essential factor in the Wings to Awakening or Bodhi Bojjhangas, etc. It is strong in the Buddha's teaching -- in the Buddha's own words "the ancient Path, rediscovered... to be seen and known for themselves by the wise." In Sri Lankan Buddhism, the Buddha himself, although certainly a male in bodily form, is sung of in poetic verse as the Budu Amma -- the Buddha Mother. A lovely article, "Feminine Elements in Sinhalese Buddhism" has been written by scholar Richard Gombrich in which these verses are translated. In these verses he is compared through numerous similes in his compassion to a mother. Shortly before her Parinibbana, the Buddha's own foster mother, in the Gotami Apadana of the Khuddhaka Nikaya, in making her farewell, says that she nourished and raised him on mother's milk -- for which he called her "Mother" and she him "Son", while he nourished and raised her on the Milk of the Dhamma, for which she called him both "Mother" and "Father" (see Walter's "A Voice From the Silence: The Buddha's Mother's Story). Of the Buddha's two foremost male disciples, the theras Sariputta and Mahamoggalana, the Buddha praised them as most excellent in their teamwork in being like both mother and wetnurse in caring for, nurturing, and raising up those being newly born in the holy life who were entering into the monastic Sangha (see Nyanaponika and Hecker's Great Disciples of the Buddha) . They were men who had transcended classical gendered roles as men, and activated their full potentiality as wisely, lovingly and compassionately present beings of responsive awareness. The foremost female disciples of the Buddha, Khema and Uppalavanna, were similarly praised by the Buddha in their leading care for the Sangha, as well as for their wisdom and power. But the disciple specifically praised as Foremost in Metta was not one of the Buddha's male or female monastic disciples, but a laywoman. (This is not to say that it could not have been a layman.) And the two of the Buddha's great disciples who were praised as Foremost in Union were a layman and laywoman couple together -- the mother and father of Nakula. Women were proactively included, as were men. Monastics were proactively included as were lay disciples. Single disciples were proactively included as were those acting and living in partnership. The Buddha asked us to remember all of them in our practice of Recollection of the Sangha as great examples of Metta in Action, of Liberated and Liberating Awareness, and of a harmonious and unified -- "in tune"- samajiva -- relational embodiment. We understand through modern neurobiology, that even the memory or imagination of such can have a profound impact on our bodies and brains. On our immune systems and health, on our experience of happiness and well being, and even on the quotients of our worldly success -- on the loveliness of our experience to abide with ease ourselves and others. Not to mention on our own path of awakening wisdom and becoming free. Turning on the lights of the spirals of genetic code that we bear, which hold so very much amazing potential, just waiting to be touched, to be called forth into life, into action. To all those saintly, non-human and very human mother beings of any and every gender who have done so -- my tribute. To all those on the Path who are doing so, and who will do so -- my tribute. To the Buddha and all those who have become buddha in his wake and that of all of his great disciples -- my tribute. To awakening itself, its factors, its folds, and its training -- my tribute. And to those who find the Way themselves due to their own merit and this very special capacity of being human -- my tribute. May you truly know the blessings of being born human.